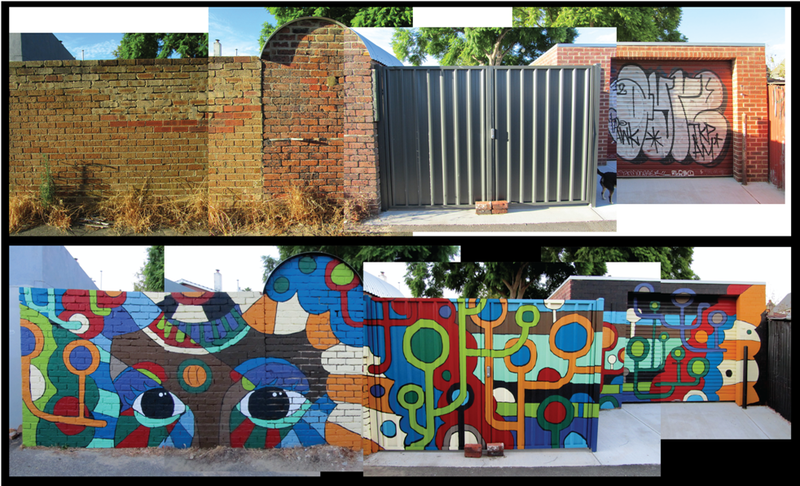 The Laneway Collective is bringing together more than 30 local artists and a whole bunch of residents and land owners to create a unique street art gallery in a forgotten laneway between Grosvenor Road and Chelmsford Road in Mount Lawley. The laneway is just behind IGA on Beaufort Street. Artist Rob Jenkins has already slaved for 40 hours on this masterpiece and still has another 20 hours to go! Amok Island has already transformed a boring blank wall in to this. Most of the action will happen in conjunction with the Beaufort Street Festival on 15 November 2014. Find out more about the Festival at www.beaufortstreetfestival.com.au. If you want to see this happen, help support it by chipping in a donation. All donations received will help support local artists to deliver this amazing project. Email Mel McVee at melmcvee@hotmail.com to find out more. Come down and help us clean up the laneway at 10am Sunday 9 November 2014. Should only take around 1 hour and you might get to meet a few of the locals.